1. When you modify the name of an object in the local object repository, the name is automatically updated in ……. for all occurrences of the object..
2. Can we add external library files in QTP? 4. What can you use to handle unpredictable testing exceptions? 5. What is the shortcut key to open a Step Generator. 6. You can also encrypt strings in Data Table cells using the ……… option in the Data Table menu. 7. When you create a test, it includes ….. action. 8. In the Keyword View, you can also view properties for items such as checkpoints. 10. For opening the QuickTest Professional Help we can use……. A) the run-time or test object properties and methods of any object in an open application. B) the run-time or test object properties of any object in an open application. C) the test object properties and methods of any object in an open application. D) the run-time object properties and methods of any object in an open application. 12. There are ………object type filters in Object spy dialog box. B) Copying of Properties and its values is possible by right clicking on it and choosing copy. B) Copying of Methods is possible by right clicking on it and choosing copy. 16. ………….. are the highest level of the test hierarchy in the Keyword view. 18. You can print the contents of the Keyword View to your Windows default printer (and even preview the contents prior to printing). 20. You can use the Keyword View to add a step ……….in your test. 21. The Documentation cell is…………. 23. The Operation cell in the keyword view specifies the operation to be performed on the item listed in the……….. Column. 24. Even if the Item column in the Keyword View is displayed to the right of the Operation column, you must still first select an item to view the list of available operations in the Operation column. 27. The correct syntax of the conditional statement starting with Do is…..
28. QuickTest processes a comment when it runs a test. 29. Press ….. to add a new step below the currently selected step. 31. You can specify the order in which the columns are displayed in the Keyword view. 32. You can view ……. while working with keyword view. 33. The …………… enables you to encode your passwords and place secure values into the Data Table. 34. You cannot manage some aspects of a local object repository using the QuickTest Object Repository automation object model..
35. For each action, you can use a combination of objects from your local and shared object repositories. 36. QuickTest adds all new objects to the local object repository even if one or more shared object repositories are already associated with the action assuming that an object with the same description does not already exist in one of the associated shared object repositories..
37. If a child object is added to a local object repository, and its parents are in a shared object repository, then you have to manually drag and drop its parent objects from shared object repository to local object repository. 39. In the Object Repository window:. A) You can delete objects from a shared object repository using the Object Repository window. 41. If an object is contained in both local and shared repositories then, during a run session. 43. For tests, you can also view test object properties and property values for objects in the Active Screen, regardless of whether the objects are stored in the object repository. 44. Object Properties window differs for objects stored in Shared and Local object repository. 46. When you modify the name of an object in a shared repository, the name is automatically updated in all tests open on the same computer that use the object repository as soon as you make the change, even if you have not yet saved the object repository with your changes. 48. You can add an object to the local object repository only if that object does not already exist in a shared object repository that is associated with the action. If an object already exists in an associated shared object repository, you can add it to the local object repository using the …….. option. 50. You can modify an object stored in a shared object repository. 51. At the time of copying, pasting and moving objects, you cannot move an object to any of its descendants. 53. You can use the Find and Replace dialog box to replace property or object names. 54. In the Associated Repositories tab of the Action Properties dialog box, the ……object repository is always listed first and cannot be moved down the priority list or deleted. 55. In the Associated Repositories tab of the Action Properties dialog box, although we can order the object repositories according to our choice except the fact that Shared Repository remains the first one and cannot be removed. 57. A test comprises calls to actions. When you create a new test, it contains a call to a …… action. B) you can view and edit the individual actions stored with your test. 62. You can display or hide the Action toolbar in the Keyword View by choosing ……..
63. The …… enables you to view either the entire test flow (the calls to the actions in the test) or you can view the steps for a selected reusable or external action. 64. In the ……., the Action List is always visible and the Expert View always displays the script for the selected action. 65. For every action called in your test, QuickTest creates a corresponding …….. in the Data Table so that you can enter Data Table parameters that are specific to that action only. 67. You cannot expand …… actions from the test flow view. 69. Sometimes you may want to call an action from within an action. This is called ……. 70. If a reusable action is called more than once in a test and you split the action into two independent actions, each call to the action within the test will be followed by a call to the new (reusable) action. If a reusable action is called from another test, however, …… it may cause the calling test to fail. 72. You must use the …… Action option in QuickTest if you want to save an action under another name. 73. When you remove an external action, you remove all calls and the action from the action list. The original action is also affected. 74. If you want to include one or more statements in every new action in your test, you can create an …. 78. You can import and export object repositories from and to …. files. 79. The Object Repository automation object model enables you to manipulate QuickTest ……. object repositories and their contents from outside of QuickTest. 80. Before using the Object Repository automation object model to manipulate shared object repository stored in Quality Center, you must download the shared object repository and save it to the file system. 81. In general, the ……. object repository is easiest to use when you are creating simple record and run tests. 82. SetTOProperty changes the property values used to identify an object during the test run. It also effects the values saved in the Object Repository for the object. 83. After creating or editing an object repository XML file, it is recommended to use the QuickTest ……….functionality to verify that your file conforms to the QuickTest object repository schema. A) two shared object repositories into a single shared object repository. B) the local object repository of one or more actions or components into a shared object repository. 86. ObjectRepositoryUtil Object Enables you to manipulate …..object repository files from outside of QuickTest Professional. 87. GetTOProperty method returns the value of a specified property for a test object from the Object Repository. 88. You can use the objects and methods of the QuickTest ……………….. to write scripts that automatically manipulate object repositories, instead of performing these operations manually using the Object Repository Manager. 89. The new Object Repository Comparison Tool is accessible from the Object Repository Manager. You can use this tool to identify the differences between objects in ……..
A) two specified shared object repository files. B) a Shared and a Local object repository files. C) either Shared or Local object repository files. D) two specified Local object repository files. 90. You must convert object repository files from QuickTest Professional 8.2.1 or earlier to the current format before you can use them in QuickTest Professional 9.0 or later. Which method lets you do so. 91. 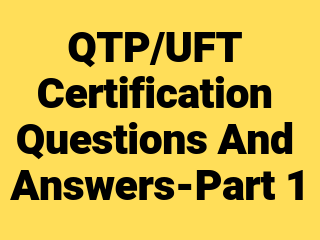 In QTP 9 or above, Test objects can be stored in two types of object repositories……..
A) a shared object repository and a Per-Action object repository. B) a shared object repository and a local object repository. C) a shared object repository and a Action object repository. 93. You open the Object Repository window for a specific component by choosing ………. 94. …….. Method Loads the specified object repository. 95. An object repository that is currently open by another user is locked, is it possible to merge a locked object repository. 96. All changes you make to an object repository are automatically updated in all components open on the same computer that use the object repository as soon as you make the changeâ€”even if you have not yet saved the object repository with your changes. 97. If you want to modify an object stored in a shared object repository, you can modify it……. B) you can modify it locally using the Object Repository window. 99. ……………. Returns an ObjectRepositories collection representing all object repository files associated with the action.